This is my first year participating in an ornament swap. I was excited to receive Becky Pancake as my partner, and first and foremost, I have to thank her for her patience in waiting for me to Express her ornament to her. Dates are all catching up on me and I really didn't want to miss this, especially after the beautiful and meaningful ornament Becky sent to me. The rules of the blog hop stipulated that an art bead had to be used in the making of the ornament, and it had to be handmade in general -- no store bought ornaments. I have a tradition in my family where on Christmas Eve, we all open a box, and it's a new ornament for the tree. I started that when I became an instant step-mom to two wonderful boys and then a mom to Zack. The idea (in my mind) was for each child to have a box of ornaments to take with them when they had their own place. It's always fun to see what we picked, except for last year when I hid them so well from myself that the only one I could find was (luckily) Zack's! I'm still looking for those ornaments. One of my Radko ornaments Rick gave me when we first married. Becky not only sent me a handmade ornament, but one with a lot of thought. She designed the ornament herself after looking through books of old-fashioned ornaments, and she made sure to add dangly bits because she knows how I love that in my jewelry. She also wrote me (hand wrote!) a letter that made me tear up and cry, in the good way. That letter is very special, Becky, and a keeper, of course. Becky is a seed-beader, someone I already bow down to in awe. So the fact that she made her own pattern, AND incorporated my favorite colors, AND shared a special art bead, is very special. It's obvious she put time into this. LOTS of time. She said the deep pink art bead reminded her of candy from her childhood, and it's certainly pretty enough to eat, for sure. And I'm not sure if this was the intention, but .... I've been reading a lot of fantasy novels to Zack lately, and I recently read one that reminded me of the Wizard of Oz, which is the first "big girl book" I owned in Kindergarten. So this ornament immediately reminded me of the hot air balloon Oz and Dorothy used to leave the Emerald City. 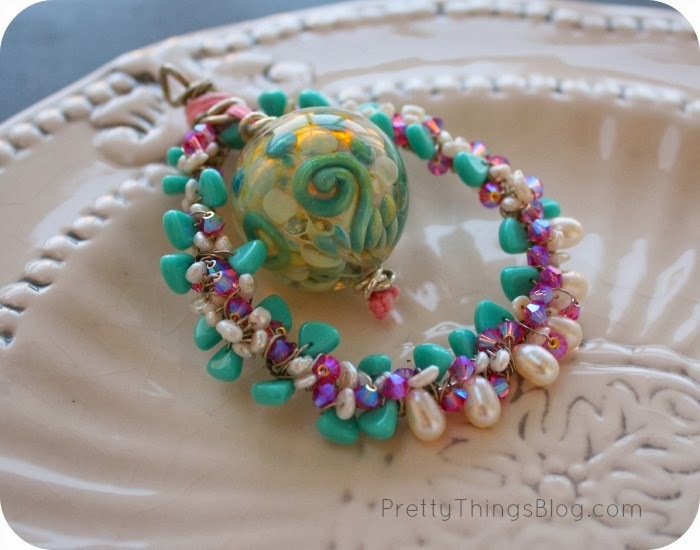 I made her an ornament with a large hollow lampwork bead and her favorite colors of pink and aqua -- pearls, crystal, and Czech glass. I was seriously late in getting it to her, (she just got it yesterday), so I apologize for the delay big time. I made Becky's ornament with a Keysha Koy hollow glass bead (LOVE her work and have a lot of her jewelry to wear). I made an armature with 14 gauge wire and with hair thin wire, started adding teeny tiny pearls, 4mm pink rose A2X crystals (which I hoard), and new Czech glass beads I got at the latest BeadFest, then added top-drilled pearls at the bottom of the ornament. I hung the hollow beads with DMC thread, and added a few love knot links of jump rings as anchors. Now Zack wants one. I guess I'd better get busy finding more beads! I showed him how I did the wire wrapping, that it's not that hard, and I may, just may, be able to get him to try it this holiday. Becky, thank you so much for so many things. The letter -- that will stick with me forever and you have no idea how much it meant to me. I read it when I'm down. The ornament -- sheer bliss. What a work of art! And your patience -- I nearly blew this hop and I'm so glad it worked out. And than you, Sally, for this annual tradition! write the ones you can't hug. Lori Anderson creates jewelry and bead kits as well as collaborative mixed media art with her son, Zack. Visit her shops by clicking on the right side bar of this blog (please and thank you!). She is also the creator of the Bead Soup Blog Party® and author of the book "Bead Soup". Oh my goodness - you hit pay dirt with that ornament from Becky! I can see why it reminded you of the Wizard of Oz - still one of my favorite movies of all time! What an exquisite gift -just beautiful! And, the ornament you gifted is equally fabulous - love how wired up the armature - the bead is a little work of art in and of self! Merry Christmas to you, Lori! I hope you find this year's stash of ornaments - and are feeling better and better each day!! Lori, I loe your family ornament tradition! My brother and I used to go to the giftshop at one of the local orchards each year where they had tons of cool ornaments we could choose from all over their christmas tree. We would pick a special one each year and put it on our tree. That was so special and always nice to look at our tree to see who picked out each ornament. I love what you made, such beautiful soothing colors and that ornament will be sparkly when Becky's tree is lit up! The ornament you received is wonderful too...makes me want to get my seed beads out and make one for my Mom this year! Merry Christmas to you and your family! I am a fan of Becky's bead weaving skills she does wonderful work. The ornament she sent to you is beautiful and very special indeed, being made with admiration and love. I agree it does look like a hot air balloon. I'm with you, I went straight to Wizard of OZ. What a precious ornament for you to treasure. I'm so very glad you got to participate, and I look forward to seeing what Zack creates! Wow, the ornament Becky made you is amazing! And the one you made her is beautiful too! Hope you find those ornaments! Beautiful ornaments!!!! Lori, just catching up on all your medical woes. I'm so glad to hear you are finally on the road to recovery! Merry Christmas and a Very Happy New Year to you and your family!! It didn't occur to me until you pointed it out, but you mentioned 'hot air balloon' and I could immediately see it. Isn't it wonderful how many different meanings a piece can hold? The ornaments you each made for each other are true treasures. Both of these are beautiful! One of these years I'm going to take the time to make some ornaments. These are definitely inspiring! Merry Christmas to you, Lori. I think of you often and pray for your health and the strength to endure. 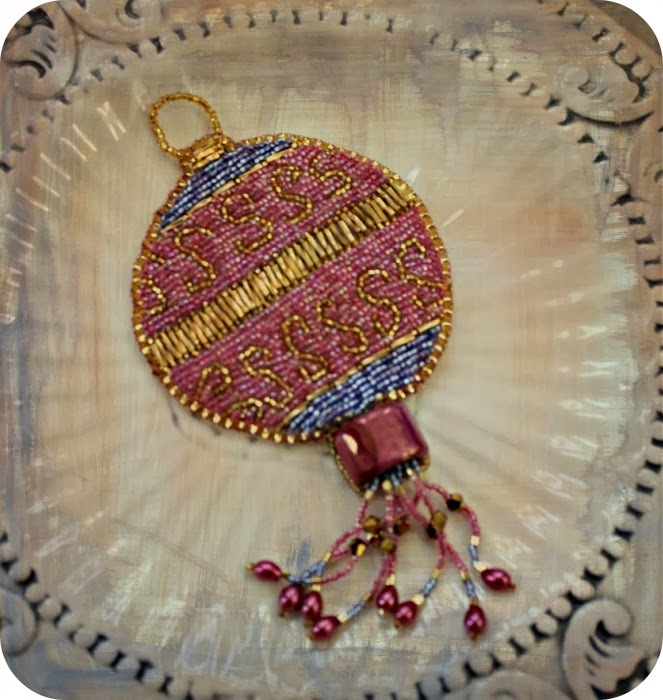 Stunning ornament Lori - I love those colors she selected for you and the seed beading is amazing! Love those dangles too!!! Hot air balloon! Travel to a land of technicolor magic and beads! I thought that too when I saw the shape. And I see the vintage style reference too! SO lovely! Happy, Merry! Lori, thank you so much for sign on this year to swap! The ornament that Becky created for you is gorgeous and it does make me think of the hot air balloon from the Wizard of Oz, I love the Wizard of Oz! Every thing about the ornament is beautiful!!! The ornament you sent Becky is great, I love the color palette and that lampwork art bead is stunning!! Those ornaments that you hid so well will show up eventually. Have a wonderful Christmas!!! That ornament Becky made for you does resemble a hot air balloon and is a little bit of happiness to hang on your tree. Beadwork like that always leaves me in awe. I do like the idea of each kid taking their own ornaments when they leave home. I started a tradition like that and now am doing it for my grandkids. Wow. Both ornaments are fantastic and will look great on each of your trees. I love ornaments and I too started a tradition when I got married of opening special ornaments on Christmas Eve. What great memories those ornaments provide each year. Happy Holidays to you and your family Lori. P.S. Hope you find those missing ornaments. Wow - Beck's ornament is amazing. The colors and detail are really lovely. It actually picks up some of the colors of the ornament you sent to her which was so, so pretty. I am not familiar with Keysha Koy beads and will definitely need to check them out. Happy Holidays! Oh, another beautiful seeded ornament! I have seen several this swap and they are all gorgeous. Becky's work is stunning. Have a wonderful holiday season, Lori, and take care super duper care of yourself! 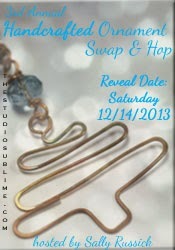 What a wonderful blog hop idea, beautiful memories for a lifetime. 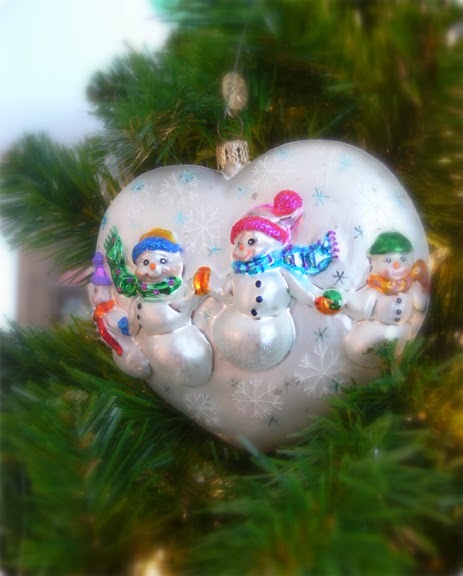 Your ornaments are both so different but equally stunning, little magical works of art! Have a wonderful peaceful Christmas. Becky's ornament is just gorgeous. The embroidery is fabulous and the thought behind it is awesome. I love the ornament you made as well. The colors are amazing and the wire wrapping is perfect. Wow..you both did awesome jobs! 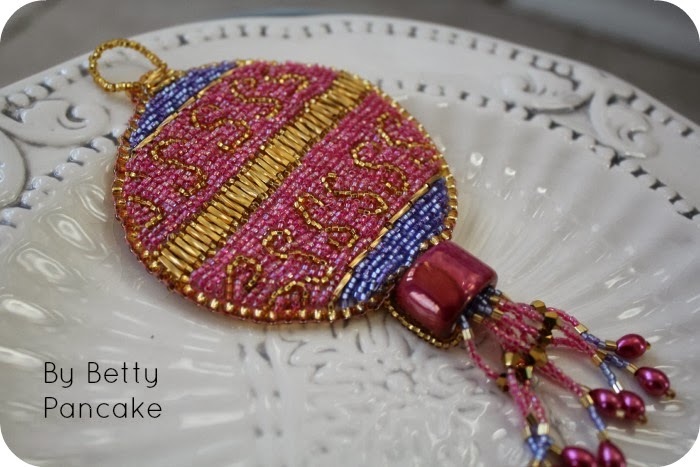 I am so wanting to get better with my bead sewing...and people like Becky are just awe inspiring. And I too have boxes that my kids put the Christmas ornaments in every year! I think I may have to get some bigger ones though.. Even though they are 20 and 21 I still get them ornaments each year. so beautiful, what can I have it? nice post and very beautiful photograph. send me email if you have another like this. thanks.